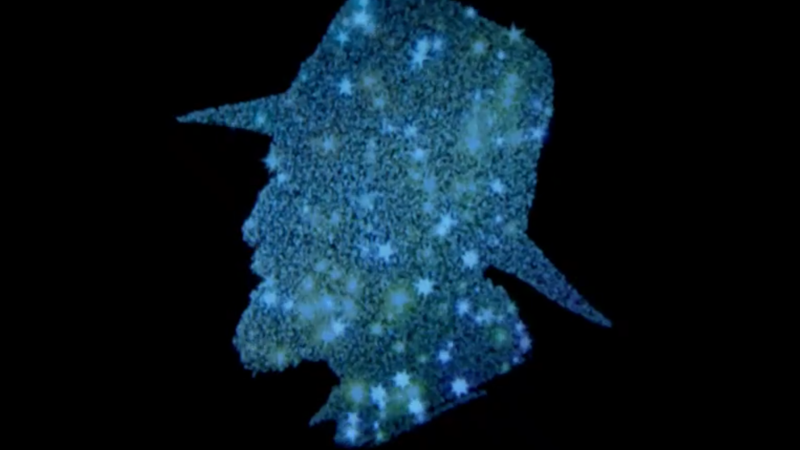 This past weekend, the BBC aired Terry Pratchett: Back in Black, a part-drama, part-documentary tribute to mark the death of one of fantasy’s most beloved authors. Typically, these sorts of specials about dead celebrities include “talking head” insight from fellow celebrities, but rarely cover the indelible mark left on seas of ordinary fans. Back in Black does, and it’s what makes it stand out as a stunning farewell to Pratchett. There are three layers to Back In Black, starting with footage taken of Terry Pratchett in the final years of his life, attempting to recall his life story and his work for a planned—and ultimately unfinished—memoir before his mind deteriorated too far due to Alzheimer’s. It’s hard to watch, even if you’re only a casual fan of Pratchett’s work, as the writer—beloved for his imagination, his wit, his ability to craft beautiful, funny, heartbreaking sentences at the drop of his trademark hat—struggles to speak, to remember a story, or even just correct turn of phrase. It inspires a sort of fury behind the sadness you feel, as the documentary unfolds and the disease that would ultimately claim Pratchett’s life gets worse and worse. It’s unfair. How dare this disease do such a thing to such a wonderfully talented man? But that fury is also ultimately reflected in Pratchett’s origin story of becoming a writer, told in the program—how he recalls the headmaster that told him as a child he’d never amount to anything, or how he loved to rail at critics who dismissed his work for not being high-brow enough. As gut-wrenching as it is to watch, it stokes in the viewer that same sense of passion and anger at the injustice of it all, that inspired the very heart of what Pratchett wrote about in Discworld. Kaye in his full getup as Pratchett in Back in Black. The second layer, interspersed throughout the documentary, is a dramatic continuation of Pratchett’s unfinished memoir. Using Terry’s own words, actor Paul Kaye—who you might be more familiar with as Thoros of Myr on Game of Thrones—is done up with beardy prosthetics and in costume, becomes Pratchett, reciting passages and segments from the unfinished memoir in character. At first, it’s jarring; Kaye’s impersonation of Pratchett is just close enough to the true thing, and the costuming is convincing enough, that it actually feels slightly distasteful to have Pratchett’s own words coming out of a mouth that isn’t his. But that issue fades away from relevance quickly, allowing what actually matters to bubble to the surface—Pratchett’s insight into his own life, but also how he faced his inevitable death with a sense of melancholy, but also the heaping of charm that you’d expect from a man as whimsical as Terry Pratchett. But the costumery of Kaye’s dramatic interludes also strikes a parallel with third, and perhaps most important layer of Back in Black: it is a documentary unabashedly about the fans of Terry Pratchett. London’s Barbican theater, packed out with fans on the night of his memorial service in April 2016. Throughout the special, in footage taken from the massive memorial service held last year after Pratchett’s passing, we see Discworld fans in costume, like Kaye is in a way, as an expression of their love for the worlds Terry Pratchett created. We also, crucially, get to hear from these fans—stories of what Pratchett’s work meant to them, how much they miss him, stories of how, in some cases his tales provided the respite that helped save their lives. Pratchett’s legacy to these ordinary people from across the world is placed on the same level of importance to Back in Black as what Pratchett meant to more famous contributors to the documentary, like Neil Gaiman, or Pratchett’s daughter Rhianna, or his longtime assistant Rob Wilkins. A moment where Gaiman’s composure crumbles while discussing how much he misses Pratchett is given the same dramatic weight in Back in Black as a fan doing much the same thing. And that matters. It all combines to make Back in Black wonderful, charming, and yet heartbreaking to watch. It’s a reminder that how much Pratchett and his work mattered, to literary culture, to his friends and family, and above all, to his legions of fans. His books were for everyone, read and loved by millions of ordinary people. It is only fitting that those people also got to take part in this beautiful sendoff to a dearly missed icon of fantasy. Currently, Terry Pratchett: Back In Black is only available to watch in the UK, via the BBC iPlayer.